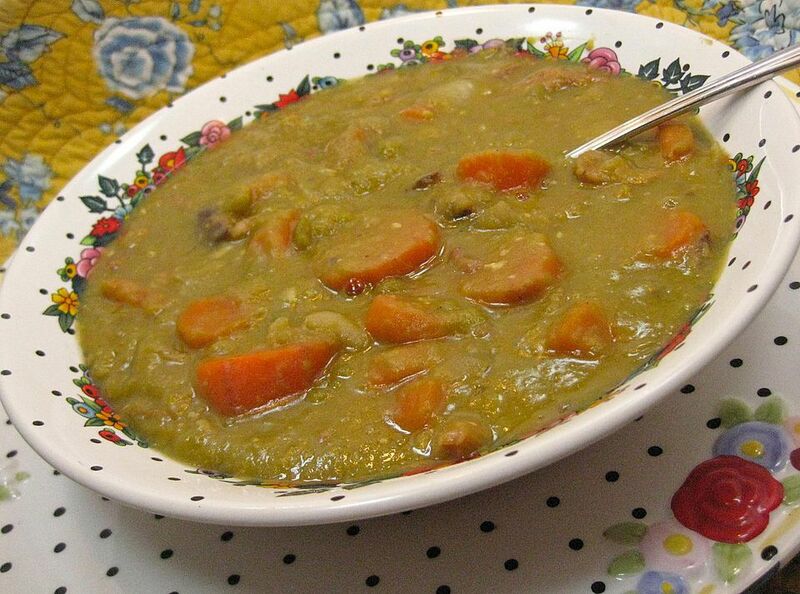 The crockpot, or slow cooker, is the perfect way to cook Split Pea and Ham Soup. Split peas are little round legumes that are dried and split naturally along the middle. When slowly cooked, they almost dissolve and thicken the soup into a beautiful thick texture. This is one of the best recipes for using leftover ham. If you don't have a ham bone, add 1 cup chopped fully cooked ham. Combine all ingredients in a 4 or 5-quart slow cooker. Cover and cook on high for 2 hours, then turn the appliance to low and cook for another 4 to 6 hours or until peas are almost dissolved and vegetables are tender. Remove ham bone or hock and cut meat off the bone. Chop meat into small pieces and stir back into the soup. Discard bone. Remove bay leaf from soup and discard. Correct seasoning, stir soup well, and serve.